Properties in Uptown/Upper Duval average 4.6 out of 5 stars. Property 4: Stylish, inviting home w/private pool in heart of downtown - walk to everything! Cuban Paradise- Sleeps 6 on Duval- One assigned parking space. Property 11: Cuban Paradise- Sleeps 6 on Duval- One assigned parking space. "LA DOLCE VITA", OLD TOWN! STEPS TO DUVAL! SLEEPS 2-4, 3 BLOCKS TO SOUTH BEACH!! Property 13: "LA DOLCE VITA", OLD TOWN! STEPS TO DUVAL! SLEEPS 2-4, 3 BLOCKS TO SOUTH BEACH!! Property 17: "MEMORY MAKER" ~This Property Was Featured on HGTV's show "Island Life"! 'LA DOLCE VITA' OLD TOWN, STEPS TO DUVAL! SLEEPS 2-4, 3 BLOCKS TO SOUTH BEACH! Property 19: 'LA DOLCE VITA' OLD TOWN, STEPS TO DUVAL! SLEEPS 2-4, 3 BLOCKS TO SOUTH BEACH! Property 21: Enjoy private pool and Old Town location at TROPICAL DREAMING, PET FRIENDLY! Property 24: Studio suite w/ shared hot tubs, patio, kitchenette - steps from beach. Dogs OK! 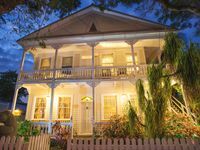 Property 25: Cozy, dog-friendly suite for two in the heart of historic Key West! "SUNKISSED"~ Come Enjoy this Charming 3 Bedroom Home When Location Is Key! Property 29: "SUNKISSED"~ Come Enjoy this Charming 3 Bedroom Home When Location Is Key! Property 31: Island condo w/ balcony & great central location - beach nearby! Dogs OK! Property 32: Hidden Beach Unit 2 The best place to stay. Duval Breeze offers walking distance to historic sites, restaurants, nightlife and the beach. Property 35: Duval Breeze offers walking distance to historic sites, restaurants, nightlife and the beach. Property 37: Cute, dog-friendly condo w/ shared hot tub in the heart of historic Key West! Property 38: ~ PETITE MAISON ~ Luxury Home w/Parking. A few Steps from Duval St! Pets Ok.
Property 45: Old Town Key West by Southernmost Beach and Duval Main Street. Property 49: Enjoy private hot tub at KEY WEST GINGER HOUSE. YOUR FIDO IS WELCOME TOO! Our extended family had a wonderful time at Seaside Place. The house fit our needs well and the kids loved the pool. The house is in a good location with easy access to Duval. Would definitely rent the house again.